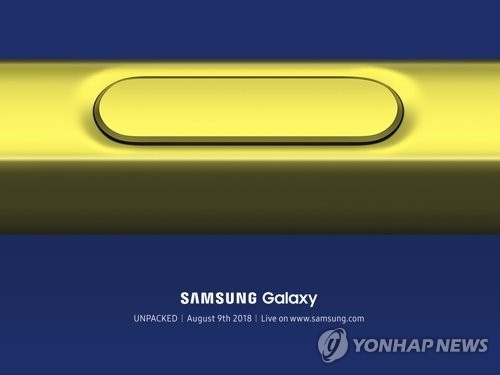 SEOUL, Aug. 9 (Yonhap) -- Samsung Electronics Co. plans to start receiving preorders for its Galaxy Note 9 in South Korea next week, industry sources said Thursday, in an apparent effort to increase its shipments. According to the sources, South Korea's three mobile carriers will take orders Monday, which is a day earlier than expected. The move seems aimed at getting as many customers as possible before archrival Apple Inc. unveils its new iPhones next month, sources here said. The official release is slated for Aug. 24. The new smartphone is expected to come with a 6.4-inch display and a 4,000 mAh battery. The screen size and battery capacity represents a bump up from the current device. Samsung is also expected to apply the Bixby 2.0 voice recognition system in the Note 9, which is expected to offer more responsiveness and features. In order to recoup lackluster sales of the Galaxy S9, Samsung is widely expected to sell the new phablet in a relatively reasonable price range. The 64GB and 256GB Galaxy Note 8s were priced at 1.09 million won (US$975) and 1.25 million won, respectively. Industry watchers said the potential 512GB edition of the Galaxy Note 9 may come with a price tag of 1.35 million won. The country's three mobile carriers and Samsung Electronics plan to display the new smartphone at around 2,500 locations throughout the country.